LA casualwear brand Juicy Couture always does everything with a tongue-in-cheek attitude. This label is all about glamour but also about playful style. 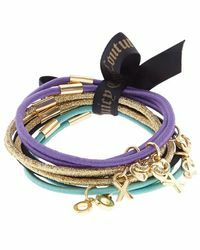 Irreverent and trend-focused, Juicy Couture appeals to women who love fashion but don't want to take it too seriously. Since it first began the brand has grown into a lifestyle label and now offers everything from swimwear through to fragrance. The range of hair accessories from the brand includes cozy faux-fur headbands for cold days and leather-chain headbands for boho moments.